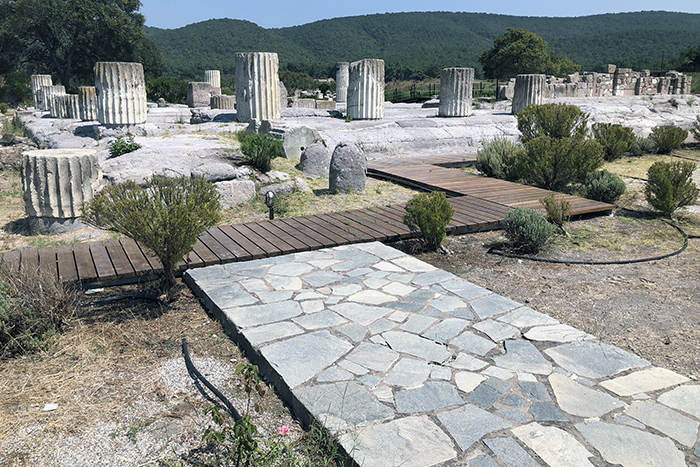 During our holiday to Lesvos this year we saw many beautiful things, but there was one location that made a deep impression on all of us: The Sanctuary of Mesa (or The Sanctuary of Messon, as it is also referred to). Specially for Rob visiting Mesa/Messon was very high on his wish list. His interest for Lesvos and its history is great and there is already so much he knows about it. And I have to admit that now I have been there, it made a deep impression on me. Even so deep that now I want to know more about it. Since our return to The Netherlands I have been reading a lot about this Sanctuary (online and offline). “I have been touched by its magic” as Rob calls it and it is quite contagious according him. The temple is near the town of Agia Paraskevi (Αγία Παρασκευή) and is the biggest temple on the island. It was dedicated to Greek deities Hera, Zeus and Dionysus or the so called “The Lesbian Triad” (and no, that has nothing to do with the sexual preference, but with the geographic location). There are two inscriptions from the second century BC where the name Sanctuary of Messon is preserved. It served as seat of the Kalloni Commonwealth. But the Sanctuary was already as early as the sixth century before BC a place for pilgrims to come from all over the island, but even from various cities of Asia Minor. It is told that beauty contents and dances related to fertility were hosted there. When we visited the Sanctuary we were the only visitors and that made it even more special. The silence was breath taking. The atmosphere was very peaceful. Mostly I am always very down to earth, but here you could literately feel that this place has a very rich history and that important events took place here. Rob had a long talk with the local guide of this historic temple and excavation site. He asked many and many questions. He wanted to know as much as possible about this place and he impressed the guide with his knowledge about Lesvos. And yes, he really knows a lot about this island. Love the article Jen. And yes, for me the Sanctuary is a place that made a very deep impression on me.